Steve Cavanagh’s Eddie Flynn legal thrillers have been one of the best thing to happen to the courtroom drama in a long time. Part of the reason is that Cavanagh is continually trying to work out how to top himself in terms of upping the tension on his protagonist. And when the first book, The Defence, started with Flynn being strapped into an explosive vest and having his daughter kidnapped, the bar has always been pretty high. The premise of the fourth Eddie Flynn novel is irresistible. Joshua Kane is a high functioning, socially disconnected serial killer who does not feel pain. And he has a plan. But while Kane’s story is very much part of the narrative, his connection to the high profile case that Flynn has been brought in on only emerges slowly. Flynn has been hired by high flying lawyer Rudy Carp to second chair on the defence of movie star Bobby Solomon, accused of murdering his wife and their security guard. Flynn, with his radar for guilt and innocence, believes that Bobby is innocent and takes the case. 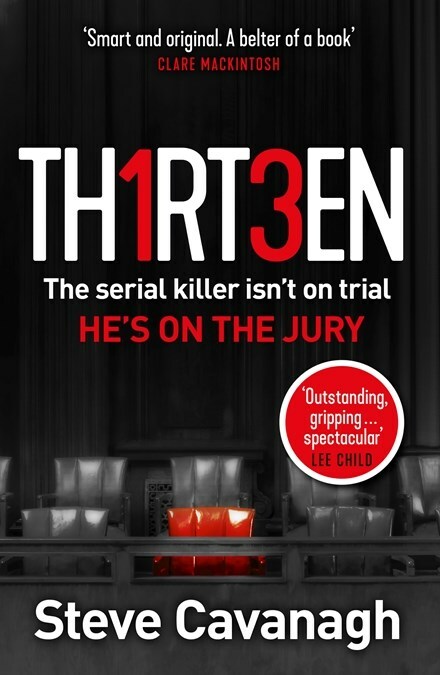 Before long Kane’s roll in this affair becomes clear as he is not only the actual killer but has taken another man’s identity to get himself on the jury for the trial itself. To talk any more about the plot would be to reveal many of the twists and turns. Suffice to say that once again, Flynn uses not only his legal knowledge, deductive powers and his group of investigative friends but his skills as a con man to work the case. Flynn’s tactics put Kane’s plans under pressure and the two begin a cat and mouse game, only Flynn for the most part is unaware that there even is a game going on. Thirteen is another great entry in what is already a great series. Once again, Cavanagh has crafted an absolutely page-turning thriller. A heady mix of legal manoeuvring, Flynn’s con artist techniques and action (Flynn once again cops a lot of punishment). The Eddie Flynn books are not a true reflection of the American legal system but really, that doesn’t matter. What they are is fun, engaging legal action thrillers with a great central character.